Gmail backups gained importance owing to the Google outages. Slow performance of Gmail for hours and unexpected deletion of data from mailbox were some of the consequences of outages that adversely affected the work flow of organizations. Therefore, in order to deal with such circumstances, Gmail emails, contacts and calendars were suggested to be backed up on external hard drives so that at critical times, the backup is used to bring official works to their normal functioning. But how to save Gmail emails to external hard became a query that called for an answer. Soon after Gmail mailbox backup gained significance, we took the initiative to provide our users with the most reliable way to make backup of Gmail data. Tool for Gmail Backup Creation : Our Gmail Backup software is aimed fully created with the aim to backup mailbox emails, calendars and contacts. The software renders a simplified backup creation and restoration mode by migrating the data as PST, MBOX & EML file format. The advantage that can be acquired with this facility to convert Gmail to PST, MBOX, MSG & EML allows users to gain a quick access to some crucial components of the mailbox. Both PST, MBOX & EML are flexible file formats that can be accessed in very popular desktop email applications like Outlook Express and Outlook. Moreover, with this, users get solution as how to save Gmail emails to external hard drive too. With brilliant options embedded in the tool, users can attain maximum benefit from it. 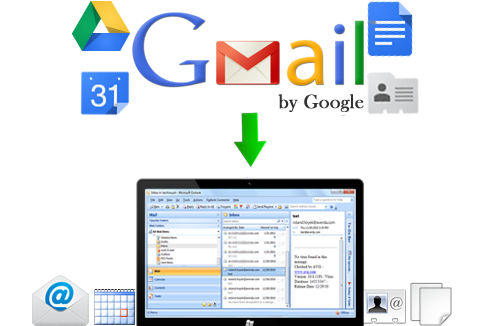 To get an idea as how the software converts Gmail to EML, MBOX & PST or how to export Gmail to hard drive, users can download its trial version that allows backup a maximum of 100 email items & 25 other items including contacts, document, calendar for gaining satisfaction in software. Once gratified with the potential of the solution to backup Gmail data, investment in complete version of the tool can be made for a lifetime promise for Gmail data protection.